Our world is full of borders separating countries, cutting-off communities, and preventing the free movement of basic goods. How secure are these borders in a modern world? Rather than taking down borders and building bridges through dialogue and transforming initiatives, governments seem to focus more on developing advanced security systems, to their rationale, to protect and create a sense of safety. With the advent of the Internet and its mass usage in creative ways, do borders and security systems still live to their purpose or have they grown archaic in our tech-run world? Young Palestinian musicians in Gaza may have a word or two to say about this matter and through the Internet, their voices are heard. Gaza, located next to the State of Israel and Egypt, is a 360 square mile densely populated area that is completely closed off to the rest of the world besides two border crossing at the Erez Crossing with the State of Israel in the north and the Rafah Crossing with Egypt in the south. Currently governed by the Islamist group, Hamas, Israel and Egypt have shared responsibility for enclosing the area since 2006. Besides the basic calorie by calorie necessities to live and so often celebrity politician visits, the siege on Gaza does not allow much to enter nor much to exit. Unemployment is high. Basic food items such as flour and water can be hard to come by. The sewage and electricity systems are in need of repair and not always fit for use creating public health concerns. Despite all of these problems that instill fear and desperation in many, let’s listen to the voices of young Palestinians who are empowered by music education taught at The Gaza Music School. It was damaged by an Israeli bomb – but the Gaza Music School is quickly becoming a symbol of resilience. It’s a fair question. This centre of artistic excellence may conflict with Gaza’s popular image. But it is already nurturing a young musical generation worthy of its peers elsewhere. Each of the 52 boys and 73 girls come three times a week after school for two sessions of learning an instrument and one for theory. While many have never touched a musical instrument before, they have all passed competitive tests of ear and rhythm to get in. Among several Gaza prizewinners who performed in the last national Palestinian music competition by video link – because students cannot leave the territory – a seven-year-old qanun player, Mahmoud Khail, came first in his age group. This April the school will become the fifth full branch of the Edward Said National Music Conservatory – the leading Palestinian music institution named after the nationalist writer and music lover who died in 2003. But the school is also a powerful symbol of Gaza’s resilience. It was founded three years ago at Palestinian Red Crescent premises in Gaza City’s Tel el Hawa district with finance from the Qattan foundation and the Swedish government. The first crop of students gave their first concert on 23 December, 2008. Four days later, Israel’s military onslaught on Hamas-controlled Gaza opened with an aerial bombardment which landed a direct hit on the Preventative Security HQ and damaged nearby buildings including the school. Director Ibrahim Najar, a music graduate from Cairo University and a maestro of the qanun, was in the building at the time. He suffered only cuts and bruises and came back two days later to store the instruments in the school’s innermost space, the bathroom. But then on 14 January, Israeli troops entered Tel el Hawa. The PRCS building was hit, and the school and several of its instruments, including the precious piano, were destroyed. 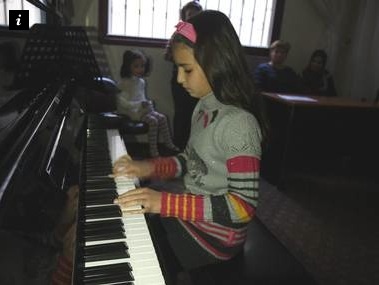 Thanks to the US NGO Anera, replacements were brought across the border despite the Israeli-imposed blockade, including two brand new pianos, and the school was up and running in new premises. That the school offers European as well as Arab classical music is thanks to a group of musically qualified east European women among the sizeable number who married Gazan men travelling to the former Soviet bloc for study. Yelina Lidawi, a North Ossetian, graduated from Rostov Conservatory and taught music in Vladikavkaz before coming to Gaza with her husband in 1999. Yet, having no piano, like her pupils (unlike Abdel Aziz, who has a more transportable qanun) she depends at home on a digital keyboard. In all of Gaza, with its population of 1.5 million, she estimates there are probably only half a dozen pianos. Gracefully acknowledging the talents of her charges, she points out that “we make a very strong selection. Last year we had to choose 40 pupils out of 250 who applied”. Although tuition is at present free, many pupils are middle-class by Gaza standards – often with professional or academic parents. But beside running a scholarship programme in its existing centres to ensure that no talented pupil is excluded by poverty, the Conservatory has a growing outreach to more deprived, or culturally conservative areas. The stance did not stop the conservatory-run Palestine National Orchestra playing an inaugural concert in the mixed Israeli city of Haifa last January. The target audience was Israeli Arab but Jews – and Israeli TV – were welcome. Mr Khoury had declared: “Today an orchestra, tomorrow a state.” After all, Israel’s birth in 1948 came 12 years after the formation of the orchestra which became the Israel Philharmonic.